The ASUS VivoMini VC66 is a compact Windows 10 Home system that operates on an Intel Core i5-7400 processor along with 4GB of DDR4 2400 MHz memory to tackle everyday tasks. The 7th-generation Intel Core i5-7400 processor is outfitted with four cores that operate at frequencies between 3.0 and 3.5 GHz to provide energy efficiency. With an integrated Intel HD Graphics 630 chipset coming from the CPU, the VivoMini VC66 delivers 4K visuals through its HDMI, DisplayPort, and DVI-D outputs. For long-term storage, it comes equipped a 500GB 5400 rpm 2.5" hard drive, and Windows 10 Pro is installed on this drive. There's also a built-in SuperMulti DVD burner for playing DVD movies and creating DVD home movies. ASUS has outfitted the VivoMini VC66 with one USB 3.0 Type-C port as well as two USB 2.0 and three USB 3.0 ports to access your printers, external storage drives, and other devices. For accessing the Internet, it is equipped with a Gigabit Ethernet port along with 802.11ac Wi-Fi. Another notable provided wireless technology is Bluetooth 4.1, which lets it connect with Bluetooth-enabled speakers and headsets. Aside from wireless connections, the VC66 has one audio jack as well as one serial port. Included along with the VivoMini VC66 mini desktop computer are a wired keyboard and mouse along with a VESA bracket, which lets you attach the desktop behind a monitor or on a wall. 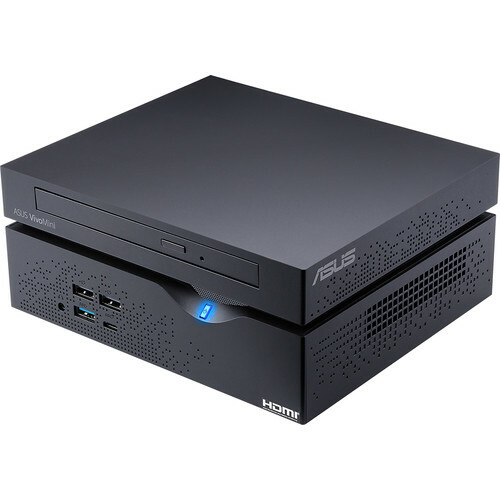 Powered by a 7th-generation Intel processor, the ASUS VivoMini VC66 is suited for processor-intensive tasks such as media editing or 3D modeling. The 4GB of DDR4 2400 MHz memory offers 1.5x faster speeds and 20% better energy-efficiency, versus DDR3 1600 MHz memory. This provides you with fast and efficient performance for daily multitask computing. The VivoMini VC66 lets you browse the web, view pictures from your memory card, or watch movies in 4K UHD resolution. HDMI, DisplayPort, and DVI-D outputs ensure compatibility with monitors, TVs, and projectors. The VivoMini VC66 also allows you to work on two displays at the same time. The VivoMini VC66 has a versatile modular design that provides room for an optical drive, M.2 SSD, and 2.5" drive. The VC66 features a quick-access cover for easy component upgrades and maintenance. Switching out the storage drives or DDR4 memory modules is simple-all you need is a screwdriver. The VivoMini VC66 has a compact chassis that weighs 2.9 pounds and comes with VESA support, so it can be mounted to a wall or the back of a monitor. Moreover, it features vents that ensure sufficient cooling. The VivoMini VC66 features four easily accessible front-mounted USB ports, including one reversible USB 3.0 Type-C port. There are two additional USB 3.0 ports on the rear panel, along with an Intel Gigabit Ethernet port, a 4-in-1 card reader, and an audio output. The VC66 has HDMI, DisplayPort, and DVI-D outputs. A serial port lets you connect the VC66 to legacy embedded systems like bar-code scanners, printers, routers, modems, and other devices for point-of-sale systems and vending machines. In addition, the VC66 has 802.11ac Wi-Fi, Bluetooth 4.1, and Kensington lock support. The VivoMini VC66 is energy efficient by drawing as little as 18W at idle. It also generates 19dB of noise at idle. ASUS Business Manager is a one-stop suite of apps and functions designed to help small business owners. With ASUS Remote Management Tool, you can quickly and easily manage all systems in the organization. This tool lets systems integrators access BIOS settings, update BIOS, monitor systems performance, remotely manage power settings, and customize DMI values. Additionally, 100GB of ASUS WebStorage is free for an entire year, so you can store and access your files in the cloud and share them across multiple devices. ASUS WebStorage offers a keyword search feature to locate files. ASUS Mini PCs can cope with extreme conditions, ranging from dry -40°F (-40°C) temperatures to humid and hot environments exceeding 140°F (60°C). The VivoMini VC66 sports a Kensington lock slot and supports TPM data security. Box Dimensions (LxWxH) 20.0 x 10.0 x 5.1"